Thursday, March 1st, 2012, marked the beginning of a seven-day long series of activities culminating to the 101th annual commemoration of the International Women’s Day on March 8th across the world. The just-ending week sought to celebrate women’s achievements and create awareness on the barriers that still exist towards achieving gender equality, Zebib Kavuma, a United Nation’s representative noted in a message she read on behalf of Mr. Aeneas Chuma the UN Resident and Humanitarian Coordinator in Kenya during the launch of the International Women’s Day week at the Kariokor Social Hall in Starehe District, Kenya. The last International Women’s Day event I participated in was in Washington DC in March 2010 as part of the CARE annual conference where we underwent advocacy training and made a trip to Capitol Hill to urge our congress women and men to support outstanding bills that would protect girls from child marriages and recognizing this practice as a human rights violation, reduce chronic global hunger by half by 2015 as well as support programs that sought to reduce preventable maternal and infant deaths worldwide. Having had to cancel my participation in last year’s events due to competing priorities, I was curious about what events had been planned in recognition of this year’s International Women’s Day. Being in Kenya, I reached out to Stella Maranga, Gender and Governance Advisor at UN Women, Kenya to determine how I might possibly volunteer in support of any planned activities. Maranga promptly emailed me a schedule of events planned for March 1st by the Ministry of Gender, Children and Social Development. I arrived at the Kariokor Social Hall at 8:45 a.m. where I met some of the ministry’s officials, one of them a relative I hadn’t seen for so many years. The Kariokor Social Hall was buzzling with life and color from the preparations by different groups – women’s groups, singers, dancers, non-governmental organizations and vendors – that had gathered to participate in this important day. We were requested to congregate at the Pumwani Boys Playground and participate in a procession back to the Kariokor Social Hall for the launch. I was requested by one of the ministry’s officials to hold the Kenya flag in guard as we awaited George Aladwa, the Nairobi mayor to “flag off” the procession. The last time I held the Kenyan flag in guard was more than 30 years ago when as a girl guide, I regularly helped raise the flag during my primary school assemblies. Overcome by a strong sense of responsibility, duty and call to service, I held on tight to the flag thinking deeply about the significance of this day and moment. The procession jovially appreciated the sound track of the Nairobi Prisons band’s music as crowds gathered to catch a glimpse of the parade. Upon arrival at the Kariakor Social Hall, the program kicked off with prayers from participating religious representatives and as in the African tradition, songs and dances from all age groups were a major part of the celebration. Colorful projects and product exhibitions by various area women’s groups adorned the social hall as the entertainment, speeches and a free medical clinic continued in the designated open air space. The theme of this year’s International Women’s Day is “Empowering Women and Girls, Inspiring Futures”. The guest of honor at the launch was Hon. Bishop Margaret Wanjiru, MP and Assistant Minister for Housing in Kenya. Wanjiru noted some of the accomplishments that have been made thus far in seeking gender equality, for instance the commitment of the Kenyan government in implementing the Presidential Decree on 30% Affirmative Action which increased the number of women involved in decision making processes in the public sector. Wanjiru challenged employers to adhere to the decree so as to include more women in decision making processes. She acknowledged programs that seek to economically empower women by addressing gender inequality and impediments on the education of the girl child. Wanjiru noted that the establishment of the Women’s Enterprise Fund continues to facilitate women’s access to credit and the new Kenyan constitution promotes gender equality, specifically through the establishment of the National Gender and Equality Commission as a Constitutional Office; land policies that seek to address previous injustices and issues of gender and property rights as well as dual citizenship that now confers/donates citizenship to foreign husbands and children of Kenyan women, among others. Wanjiru also called upon her fellow parliamentarians to pass the Family Protection, Marriage and Matrimonial Property Bills of 2009 that seek to reduce incidences of Gender Based Violence and protect women and children against other socio-economic and cultural injustices. She called upon communities to abandon harmful cultural practices like female genital mutilation and child marriages that are human rights violations and deny women and children equal opportunity. 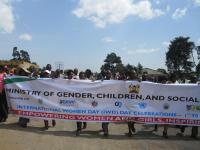 The 101th International Women’s Day in Kenya is being celebrated as a national event in Bungoma District, Western province.